BelarusDigest > All > Is Belarus on the Brink of Financial Collapse? Is Belarus on the Brink of Financial Collapse? 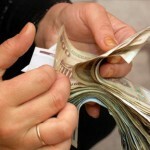 The National Bank of the Republic of Belarus has recently started devaluation of the Belarusian ruble. Foreign currency is now officially allowed to be traded at an exchange rate that is deviating as much as 10 percent from the official rate set by the Bank. The poor competitiveness of the Belarusian economy was the main impetus for an urgent devaluation of the currency. According to Timothy Ash, head of emerging market research at RBS in London, the rapid reduction in convertible foreign-currency reserves would necessitate an eventual 20-30 percent drop in the rate of the Belarusian ruble. Supposing that the RBS analyst is correct, within the next 3 months, Belarus will further devalue its currency by 36-44 percent relative to January 2009 levels. This dramatic devaluation is aimed at decreasing the current account deficit by encouraging exports and limiting imports. In the short run, this may help to revive economic activity; judging it with a longer-term perspective in mind, however, the rebound of the Belarusian economy is highly unlikely. The widening current account deficit, which presently stands at 16 percent of GDP, may contract insignificantly in the short run: it would be cheaper for foreigners to buy Belarusian exports. At the same time, Belarusians would become substantially poorer and unable to afford imported goods. The fall in imports would also result in a corresponding decline in the national output, and consequently, in exports. In the long run the Belarusian economy faces greater isolation and decreasing competitiveness due to the rising costs of production, such as higher energy and commodity prices. Prior to the implicit devaluation of the ruble, Belarus claimed to be on a fixed-but-adjustable exchange rate system, a rather unsustainable illusion. The current account deficit depletes the country’s foreign exchange and gold reserves, and once these are exhausted, Belarus will no longer be able to intervene in foreign exchange markets to reverse the depreciation of the ruble oversupplied due to decreasing demand for Belarusian exports. Inevitably, the government will have to devalue the currency even further. The government would not be able to finance a gap on its own because the current account balance stands at negative $8 billion while Belarus has only $3.4 billion in reserves. The current account deficit is not a usually terminal problem. The US economy, for example, has run large account deficits for several decades. As long as a country’s capital account surplus compensates for the current account deficit, the economy will sustain itself, at least for some time. In Belarus, however, that the capital account surplus is diminishing due to growing international concern for the country’s ability to meet its financial obligations. This fading creditworthiness is reflected in the rising interest rates at which Belarus can borrow on international markets. Thus, the dwindling capital account surplus will not match the expanding current account deficit. If Belarus fails to conduct a large-scale sale of government-owned assets (privatization) and secure financial support from regional partners, it will enter a cycle of devaluation that may end in a default, driving the general population deeper into poverty. Privatization and foreign investments in Belarus have long been impeded by the so-called Golden Share Rule, according to which the government had a privilege to participate in the management of foreign enterprise state territory. On March 4, 2008, President Alyaksandr Lukashenka signed Decree No. 144, which abolished the Golden Share Rule. However, because of the growing isolation of the Belarusian economy, the contentious political relations with the West, and the recent economic sanctions, Western investors are increasingly reluctant to buy Belarusian assets. Because the United States and the EU hold a cumulative 33 percent voting power on the Executive Board of the IMF, any decision to lend money to Belarus will be blocked. Moreover, Belarus is set to repay a $2.3 billion IMF loan over the next three years. A traditional way out is for Belarus has been to turn to its Eastern neighbor, Russia, for more loans. Moscow is increasingly likely to impose unfavorable lending conditions on Belarus, however. It is increasingly willing to offer loans only in exchange for the ownership of the Belarusian state-owned assets. With nearly $483 billion in reserves and the oil prices on the rise, Moscow is in a strong bargaining position, whereas Belarus seems to have no better alternatives than play by Russia’s rules. The most sensible way out of the economic crisis is selling unprofitable enterprises to private or state investors in the Former Soviet Union and hoping that they can revitalize them. The inevitable consequence of such policies, however, is the rise in unemployment, only partially offset by the expansion of profitable enterprises. Belarus’ current economic problems are a yet another sign that the country can no longer delay fundamental economic reforms. The example of China in the 1970s could be instructive in this regard. While China is different from Belarus in most respects, the formula for long-term economic success is similar – the introduction of market incentives for agriculture and manufacturing. It is high time for the Belarusian economy to pivot toward the global market and profitability. Foreign direct investment and trade liberalization are crucial. Finally, it is important to note that while all of the above methods are good in theory, the current political environment hampers their implementation. True economic liberalization and progress are contingent on the fundamental changes in the political environment of Belarus. How Should the West Cooperate with Russia on Belarus? Last week, Russia issued an ultimatum to Belarus to present a programme of economic reforms “within 10 to 12 days”. This would be a necessary condition to begin the process of negotiations for new Russian loans to Belarus. Apparently Russia is putting more pressure on Belarus to make structural reforms. This pressure can be far more effective than any pressure coming from the European Union. There are two schools of thought with regards to cooperating with Russia in order to democratize Belarus. One views cooperation with Russia with suspicion because of Russia’s expansionist sentiments demonstrated in the events that unfolded in South Ossetia and Abkhazia. Moreover, many doubt that Russia, which has serious problems with democracy and human rights itself, can have positive influence on Belarus. Others think it is necessary to cooperate with Russia since it has long enjoyed a much stronger influence on Belarus than any other country. Lately, the Kremlin has been putting a great deal of pressure on Lukashenka and doing so at a time when relations between the two regimes were at an all time low. It seems that a return to the days of idyllic photo sessions of Lukashenka shaking hands with Russian leaders is no longer possible. For Russia, Lukashenka has become a problem rather than an ally. It can be argued that a regime change in Belarus is steadily becoming an increasingly common interest between Russia and the West. Russia has exhibited by far the largest influence on the Belarusian government, both economically and politically, amongst all other international players. Russia also poses the largest potential threat to the independence of Belarus. This is based on long-lasting post-imperial revanchist sentiment among a influential fraction within the Russian leadership. Aliaksandr Lukashenka has been successfully exploiting this post-imperial stigma with the Kremlin in order to get economic and political support since the very beginning of his rule. Recently one can witness that relations between Russia and Belarus under Lukashenka gradually transformed into Russia subsidizing Belarus for several billions US dollars annually. The Russian government abandoned this scheme a few years ago. This has been accompanied by what seemed like a serious personal conflict between Lukashenka and Russia’s ruling tandem heads of state Vladimir Putin and Dmitry Medvedev. In the aftermath of this conflict, Russia has launched a serious PR attack on Lukashenka utilizing all of the Kremlin-controlled media at its disposal. This campaign continues to dominate much of Russia’s media coverage of Belarus. The current approach to relations with Belarus is very pragmatic on both sides. The Kremlin now tries to derive concrete economic benefits from Lukashenka in exchange for extending loans to support the struggling Belarusian financial system. There are only a limited number of benefits Russia can obtain from Lukashenka: privatisation of assets, a customs union and a few more. As soon as Russia gets them, Lukashenka will not be needed anymore. He would then be little more than an obstacle and troublemaker interfering in regional cooperation efforts being made both in Europe and the former USSR. It can therefore be assumed that Russia is also interested in the gradual removal of Lukashenka from power. In the least, the Kremlin is now more willing to support a regime change in Belarus than ever before. It is therefore essential that the European Union and the United States coordinate their efforts with the Kremlin to have a common policy towards Belarus. That policy should simultaneously foresee a path to the democratisation of Belarus as well as safeguard its stability and independence.